Command the classroom, dominate the board room, enthrall the lecture hall; you can do it all with the Anchor Audio AN-130 speaker monitor. This light-weight, easy to use system fills the room with your voice and with the wireless microphone you're free to move around the room. Need to add some punch to your presentation? 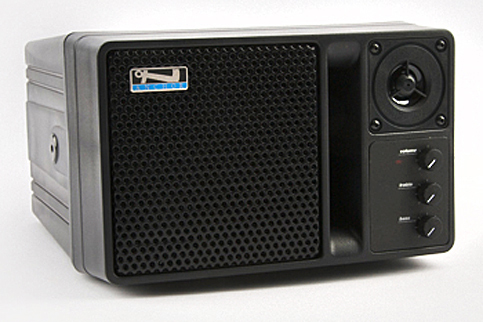 The AN-130 is ideal for use with your video projector, CD/DVD player or PC. Who uses the AN-130? Teachers, corporate presenters, anyone that needs to reach groups of one to one hundred. Mount it on a stand, place it on a shelf, set the volume and forget it - you're ready to go everyday. Does the speaker have at least two inputs so that the microphone and a PC, DVD, or other source can be connected at the same time? Or is there an input on the wireless receiver to accomplish the same thing? This speaker does allow for the microphone to be connected in conjunction with another media source. According to the product information, this speaker features two "RCA line-input jacks" along with the microphone jack and instrument input. Here is the answer direct from Anchor: Yes, the AN-130U1 model that is in the bundle does have 2 audio inputs (1/4 inch and RCA). The wireless microphone will not take up either of these inputs so both with be open for a PC, DVD or any other media player. Both the wireless microphone and the connected media player can be used at the same time.